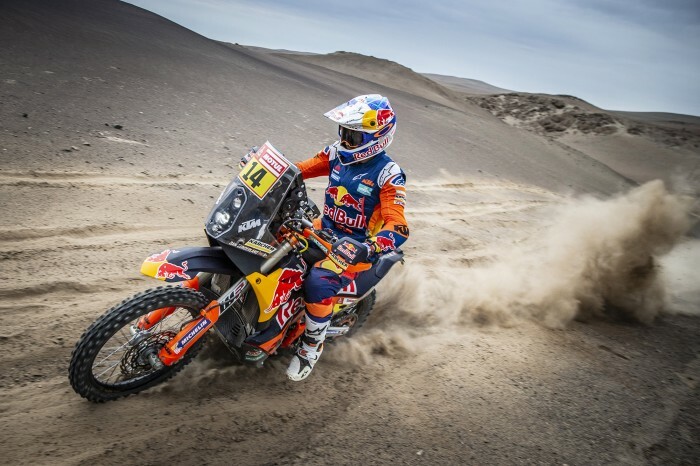 Britain’s Sam Sunderland grabbed third in the 2019 Dakar after Red Bull KTM team-mate and day-two leader Mattias Walkner crashed on the third stage. Xavier de Soultrait beat the odds after two difficult days and turned the tribulations of his adversaries to his advantage in a masterful performance during today’s diabolical stage. The Yamaha rider defeated Pablo Quintanilla by a whisker to claim his first Dakar stage win, with the Chilean Husqvarna rider taking the overall lead by a comfortable margin. “It was a really tricky stage, there was a lot of fog on the top of one of the mountains and that made riding and navigation tough. The only thing you could do was ease down on your pace a little and take a lot of care. At one point visibility was down to just a few metres,” said Sunderland.